Warner's Batman v Superman: Dawn of Justice took in $15.04 million on Monday to lead the daily box office for a fourth consecutive day. 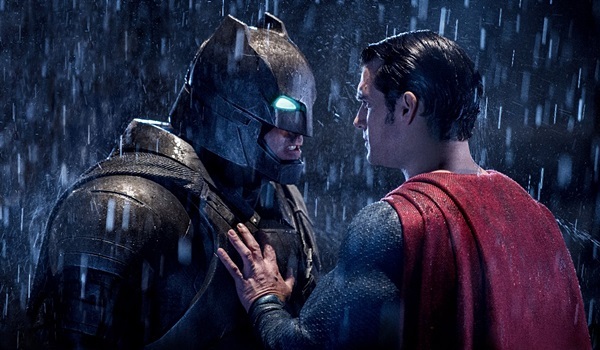 The blockbuster 3D superhero film starring Ben Affleck and Henry Cavill was down 55.5 percent from Easter Sunday. It should be noted that Monday's grosses in general were aided by the post-Easter frame. Batman v Superman had a slightly stronger first-Monday hold than that of last year's Furious 7, which declined 58 percent on the Monday after Easter to gross $14.02 million. 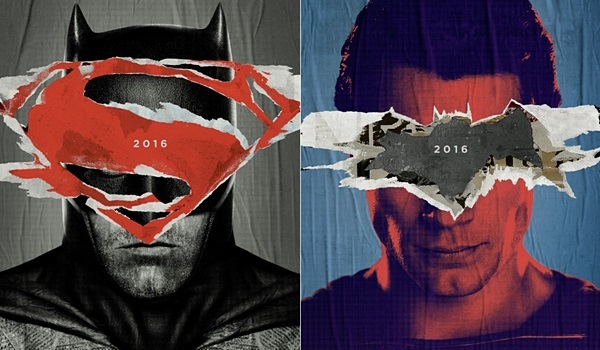 Batman v Superman has grossed $181.05 million through four days of release. That represents the eighth largest four-day start of all-time. Batman v Superman is currently running 12 percent ahead of the $161.20 million four-day take of Furious 7 and 11.5 percent behind the $204.50 million four-day gross of last year's Avengers: Age of Ultron. Just how big of an impact negative critical reviews will have on the holding power of Batman v Superman going forward remains to be seen. Disney's Zootopia remained very strong on Monday with a second place take of $4.74 million. The blockbuster 3D computer animated film from Walt Disney Animation Studios decreased just 20 percent from Sunday and increased a healthy 27 percent over last Monday. Zootopia is quickly approaching the $250 million domestic mark with a 25-day gross of $246.17 million. That places the film 17 percent ahead of the $210.41 million 25-day take of 2014's The LEGO Movie and 14 percent behind the $286.59 million 25-day gross of last year's Inside Out. Universal's My Big Fat Greek Wedding 2 took third with $2.02 million. The long-awaited comedy sequel starring and written by Nia Vardalos declined 51 percent from Sunday. My Big Fat Greek Wedding 2 has grossed $19.88 million in four days. The film continues to run on the very high end of expectations and perform nicely with its modest production budget in mind. My Big Fat Greek Wedding 2 is running 3 percent ahead of the $19.24 million four-day start of last year's The Intern. Sony's Miracles from Heaven and Lionsgate's The Divergent Series: Allegiant claimed fourth and fifth place with respective daily grosses of $1.39 million and $1.23 million. Miracles from Heaven was down 51 percent from Sunday and up 3 percent from last Monday, while Allegiant declined 42 percent from Sunday and 39 percent from last Monday. Respective total grosses stand at $47.77 million for Allegiant in eleven days and at $35.69 million for Miracles from Heaven in thirteen days. Given respective costs, expectations and holding power, Miracles from Heaven is obviously having the much more impressive run of the two films. Monday Morning Update: Bridget Jones' Baby landed firmly in the top spot this past week for most new likes for upcoming films with a hugely impressive 239,024. Coming into the week most people didn't even realize a three-quel was in the works as its Facebook page had not even 40,000 likes but that quickly changed once the trailer made its rounds online. The first two films were massive worldwide successes, each bringing in over $250 million globally but with 12 years between films I was wondering just how relevant and appealing it would be. The overwhelmingly strong response on both Twitter and Facebook quickly answered that and like My Big Fat Greek Wedding 2 I think its safe to say that the premise is still very much appealing to audiences. The other standout on the week was The Shallows which had over 48,000 new likes this past week after the success of its first teaser trailer. Despite being a non-sequel and not based off a comic superhero it has managed to amass 100,000 likes three months prior to release. Its true films about sharks have a special place in moviegoers hearts thanks to Jaws and its sequels, Shark Week on Discovery, even Sharknado holds a special place in pop culture. The common denominator is of course Sharks, who make for one hell of a fascinating villain in films. The reception here for The Shallows shows definite interest which should build its awareness in the coming months. If it can manage to score solid early critical buzz this could be a massive worldwide success in the making. While that might be a big if, the early signs here are very positive and I'm looking forward to see how it manages to build buzz in the coming months. Monday Update: With actuals now in, Warner's Batman v Superman: Dawn of Justice opened with $166.01 million this weekend. The blockbuster superhero film starring Ben Affleck and Henry Cavill was ultimately over-estimated by just over $4 million on Sunday. Batman v Superman registered the seventh largest opening weekend take of all-time (without adjusting for ticket price inflation). The film opened with $81.56 million on Friday, fell 38 percent on Saturday to take in $50.66 million and declined 33 percent on Sunday to gross $33.79 million. Disney's Zootopia took second this weekend with $24.02 million, which represented a very solid 35 percent decline. Universal's My Big Fat Greek Wedding 2 opened in third place with $17.86 million. That was towards the very high end of expectations. Meanwhile, Sony's Miracles from Heaven ultimately edged out Lionsgate's The Divergent Series: Allegiant for fourth place. Miracles from Heaven was down 35 percent to take in $9.69 million, while Allegiant fell a very sharp 67.5 percent to gross $9.44 million. Sunday Update: Warner's Batman v Superman: Dawn of Justice was off to a very successful debut this weekend with an estimated $170.1 million. The blockbuster superhero film starring Ben Affleck and Henry Cavill established new opening weekend records for the month of March (a record which was previously held by the $152.54 million launch of 2012's The Hunger Games) and for Easter weekend (a record that had just been set last year by the $147.19 million start of Furious 7). Batman v Superman also delivered the largest debut of 2016 thus far (topping the $132.43 million three-day start of Deadpool) and the sixth largest opening weekend performance of all-time (without taking into account ticket price inflation). While poor critical reviews likely prevented the film from breaking out even further, they clearly didn't prevent it from getting off to a strong start, as Batman, Superman and Wonder Woman appearing in the same film made Batman v Superman a critic-proof event for moviegoers this weekend. Batman v Superman opened with $82.01 million on Good Friday (which included an estimated $27.7 million from Thursday night shows that began at 6 p.m.), fell 38 percent on Saturday to take in $50.92 million and is estimated to decline 27 percent on Easter Sunday to gross $37.17 million. That gives the film an estimated opening weekend to Friday ratio of 2.07 to 1. In comparison, last year's Furious 7 had a ratio of 2.18 to 1 over Easter weekend. The audience breakdown for Batman v Superman skewed towards male moviegoers (62 percent) and towards moviegoers over the age of 25 (60 percent). In addition to its mentioned poor critical reviews, initial word of mouth for Batman v Superman appears to be lackluster. The film received a modest B rating on CinemaScore and has a current Flixster audience score of 73 percent. While those aren't promising signs going forward, they do suggest that the film is going over better with moviegoers than it has with critics. Batman v Superman could also still be helped out in the near future by the relatively modest line-up of new wide releases entering the marketplace over the next two weeks. Batman v Superman took in $17.96 million from IMAX locations this weekend. That represented 10.6 percent of the film's overall grosses this weekend. An estimated 40 percent of the film's grosses came from 3D screenings of some kind this weekend. RealD 3D showings accounted for $47 million on their own. After leading the box office for each of the past three weekends, Disney's Zootopia took second place this weekend with an estimated $23.14 million. The blockbuster 3D computer animated film from Walt Disney Animation Studios continued to hold up well, as it was down a solid 38 percent. Without adjusting for ticket price inflation, Zootopia registered the 15th largest fourth weekend gross of all-time. Zootopia is quickly approaching the $250 million domestic mark, as it has grossed $240.55 million in 24 days. That places the film 15 percent ahead of the $209.14 million 24-day take of 2014's The LEGO Movie and 15 percent behind the $284.20 million 24-day gross of last year's Inside Out. Universal's My Big Fat Greek Wedding 2 was off to a very nice third place start with an estimated $18.12 million. The long-awaited comedy sequel starring and written by Nia Vardalos opened on the very high end of expectations and performed well with its modest production cost in mind. My Big Fat Greek Wedding 2 presented strong counter-programming this weekend for those not interested in Batman v Superman (similar to Mamma Mia!, also a Universal release, successfully opening against The Dark Knight back in 2008). The opening weekend performance of My Big Fat Greek Wedding 2 was just ahead of the $17.73 million debut of last year's The Intern. My Big Fat Greek Wedding 2 started out with $7.25 million on Friday (which included an estimated $1.02 million from Thursday night shows), declined 12 percent on Saturday to gross $6.35 million and is estimated to decrease 29 percent on Sunday to take in $4.52 million. That places the film's estimated opening weekend to Friday ratio at 2.50 to 1. The audience breakdown for My Big Fat Greek Wedding 2 skewed heavily towards female moviegoers (76 percent) and towards moviegoers over the age of 35 (60 percent). The film received a healthy A- rating on CinemaScore, though the film's current Flixster audience score of 70 percent is less impressive. As is the case with Batman v Superman, it does appear that My Big Fat Greek Wedding 2 is going over better with moviegoers than it has with critics. Lionsgate's The Divergent Series: Allegiant and Sony's Miracles from Heaven find themselves in an extremely close race for fourth place, as both films are estimated to gross $9.50 million this weekend. However, Miracles from Heaven held up much better this weekend, as it was down a very solid 36 percent from last weekend, while Allegiant was down a troubling 67 percent. Allegiant has grossed $46.61 million in ten days, while Miracles from Heaven has grossed $34.13 million in twelve days. Given their respective costs, expectations and holding power, Miracles from Heaven is obviously having the much more impressive run of the two films. Allegiant is currently running 46 percent behind the $85.85 million ten-day take of last year's Insurgent and running 35 percent behind the $52.46 million twelve-day gross of 2014's Heaven is for Real. Meanwhile, Paramount's 10 Cloverfield Lane and Fox's Deadpool claimed sixth and seventh place with respective weekend estimates of $6.00 million and $5.00 million. 10 Cloverfield Lane declined a sizable, but respectable 52 percent from last weekend. Deadpool was down just 38 percent, which represented an impressive hold given then added direct competition the film faced from Batman v Superman. Respective total grosses stand at a massive $349.47 million for Deadpool in 45 days and at a healthy $56.01 million for 10 Cloverfield Lane in 17 days. In its third weekend of platform release, Bleecker Street's Eye in the Sky expanded well with an estimated $1.00 million from 123 locations. That gave the critically acclaimed film starring Helen Mirren and the late Alan Rickman a per-location average of $8,138 for the frame and ranked the film in tenth place among all films this weekend. Eye in the Sky was up 137 percent over last weekend (when it was playing in 88 fewer locations) and also saw its per-location average maintain momentum nicely in the process. Eye in the Sky has grossed a promising $1.72 million in 17 days of platform release. The film is scheduled to expand into wide release this coming Friday. Roadside's Hello, My Name Is Doris had a solid expansion into moderate release with an estimated $1.70 million from 488 locations, for a per-location average of $3,486. The Sally Field led comedy was up 70 percent over last weekend (when it was playing in 360 fewer locations) and ranked in ninth place among all films this weekend. 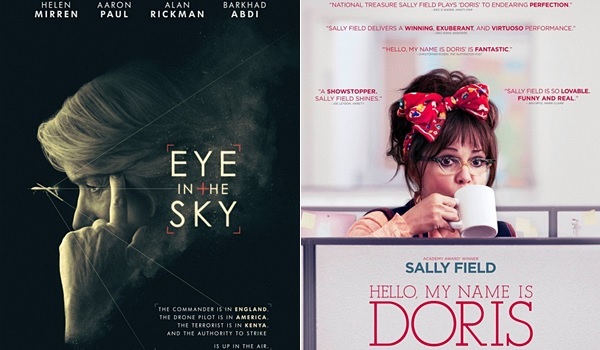 The 17-day platform total for Hello, My Name Is Doris stands at $3.27 million. Warner's Midnight Special took in an estimated $97,000 while continuing to play in 5 locations in New York, Los Angles and Austin. That gave the Jeff Nichols directed sci-fi film starring Michael Shannon a per-location average of $19,400 for the frame. Midnight Special was down a sharp 49 percent from last weekend, but was still a strong performer this weekend, especially with its lack of an expansion in mind. Midnight Special has grossed $358,000 in ten days. The film is scheduled to expand into additional locations on Friday. IFC's Born to Be Blue opened with an estimated $47,340 from three locations in New York and Los Angeles, for a promising per-location average of $15,780. The drama starring Ethan Hawke as Chet Baker has received very good critical reviews, as it currently boasts an 86 percent Tomatometer on Rotten Tomatoes. Born to Be Blue is scheduled to receive an expansion into limited release on April 8. Sony Pictures Classics' I Saw the Light started out with an estimated $50,464 from five locations in New York, Los Angeles and Nashville. That gave I Saw the Light a per-location average of $10,093 this weekend. The drama starring Tom Hiddleston as Hank Williams has received poor critical reviews, as it has a current Tomatometer of just 13 percent on Rotten Tomatoes. The film's poor reviews have no doubt limited its box office potential. I Saw the Light is scheduled to expand into wide release on Friday. GKIDS' April and the Extraordinary World started its platform run with an estimated $12,101 at the IFC Center in New York. The French animated sci-fi film featuring the voice of Marion Cotillard currently has a 100 percent Tomatometer on Rotten Tomatoes. April and the Extraordinary World will open in Los Angeles on Friday and will expand into limited release on April 8. City of Gold took in an estimated $92,400 from 33 locations, for a per-location average of $2,800. The documentary from IFC Films' Sundance Selects label, featuring food critic Jonathan Gold was up 45 percent over last weekend upon expanding into 19 additional locations. City of Gold has grossed $275,020 in 17 days and will receive a significant expansion this Friday. No one else put up much of a fight against the onslaught of Batman vs. Superman: Dawn of Justice at the global box office. The film launched in 66 markets this weekend, finishing its first frame with $254 million overseas. China led all international markets with a $57.3 million haul from approximately 16k screens, making it the biggest WB opener of all time in the market. The UK finished the weekend with $21.9 million, the biggest March opener of all time in the market. The weekend's other top performers include: Mexico ($18.6M), Brazil ($12.2M), South Korea ($10.5M), Australia ($10M), Russia ($8.5M), France ($8.4M), Germany ($8.2M), Spain ($6.3M), Italy ($5.8M), and Japan ($4.4M). Batman vs. Superman finished its first weekend with a $424.1 million global haul. Disney crossed the $1 billion mark overseas for the year in record time on Friday, thanks largely in part to the recent success of Zootopia in the international marketplace. Zootopia welcomed $42.5million from 52 territories in its latest weekend overseas. The Disney film opened in the UK to $7.3 million (including previews). China leads all markets with a whopping $201 million, followed by Russia ($28.4M), France ($26.8M), Germany ($22.1M), and South Korea ($20.5M). Zootopia has grossed a total of $456.2 million outside of North America and $696.7 million worldwide. Kung Fu Panda 3 grossed $21.5 million from 64 markets this weekend, including a 4th place debut in Australia of $2.3 million from 320 locations. The animated film has now grossed $292.7 million overseas and $432.1 million globally with four new markets set to open next week, including France. The Divergent Series: Allegiant made $9.5 million from 78 markets, taking its overseas cume up to $71.8 million. The film's top markets include France ($10.2M), Brazil ($6.4M), Russia ($5.8M), UK ($5.4M), and Mexico ($4.5M). The film has grossed a total of $118.4 million worldwide with Australia coming up next on the release schedule on April 14. The Revenant grossed $8.7m over the weekend to reach a $324.2 million overseas total. The film continues to excel in China, where it finished the weekend with an estimated $6.7 million that raises its market cume up to $51.3 million. The Revenant has grossed $506.1 million worldwide. Deadpool grossed $3 million from 31 markets to reach an overseas cume of $396.5 million. The superhero flick has grossed a total of $746.2 million globally. Gods of Egypt grossed $2.3 million from 74 markets. The film has now grossed $102.4 million outside of North America. China continues to be the top global market with $34.7 million. Other leading markets overseas include Russia ($9.8M), South Korea ($6.4M), Brazil ($4.6M), and Mexico ($4.6M). A number of high profile remain on the schedule, including Belgium (March 30), France (April 6), Germany (April 21), Spain (May 20), and UK (June 17). Gods of Egypt has grossed more than $132 million worldwide. Hail Ceasar! took $1 million from 30 territories over the weekend, including a $152k debut at 211 dates in South Korea. The Coen Brothers' latest film has grossed a total of $29.5 million overseas with four territories left on its schedule: Brazil (April 14), Mexico (April 22), Argentina (April 28), and Japan (May 14). The film has grossed $59.6 million globally.